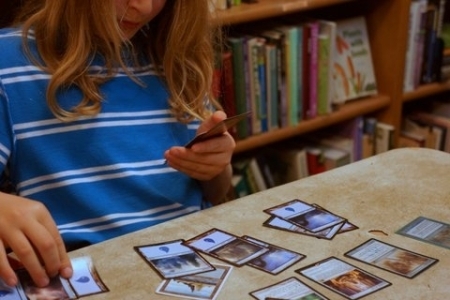 Vermont podcast Rumble Strip Vermont recently stopped by The Book Garden in Montpelier to look at one of the store’s mainstays: Magic the Gathering. Even though I don’t understand the game, I appreciate that it happens between real people, in person. Hugely enthusiastic players, ranging in age from around seven to forty-five, get together and battle it out, trade cards, and talk about creature powers. I’ve been taking my son to a Friday night game in Montpelier, Vermont–held at the Book Garden. Last time we went, instead of sitting in a foldout chair for 3 hours, I recorded interviews with some of the players. This is a really neat look at one of the things that we’ve covered week to week. I’ve not yet listened to the podcast before, and I’m pleasantly surprised to find this to be a well-produced and structured podcast. Something to follow along with! That is the least annoying my voice has ever sounded. Thank you.